0.30mm x 5.50mm UC Series PCB Drill, used for small through holes or via interconnectors. These bits are ideal for high density multilayer boards. 0.40mm x 6.5mm UC Series PCB Drill, used for small through holes or via interconnectors. These bits are ideal for high density multilayer boards. 0.50mm x 5.5mm ST Series PCB Drill, used for small through holes or via interconnectors. These bits are ideal for high density multilayer boards. 0.60mm x 9.5mm ST Series PCB Drill, are a universal drill bit witch can be used for many materials. 0.65mm x 9.5mm ST Series PCB Drill, are a universal drill bit witch can be used for many materials. 0.70mm x 10.00mm ST Series PCB Drill, are a universal drill bit witch can be used for many materials. 0.80mm x 10.00mm ST Series PCB Drill, are a universal drill bit witch can be used for many materials. 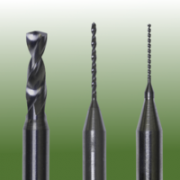 0.90mm x 10.00mm ST Series PCB Drill, are a universal drill bit witch can be used for many materials. 1.02mm x 10.00mm ST Series PCB Drill, are a universal drill bit witch can be used for many materials. 1.10mm x 10.00mm ST Series PCB Drill, are a universal drill bit witch can be used for many materials. 1.20mm x 10.00mm ST Series PCB Drill, are a universal drill bit witch can be used for many materials. 1.30mm x 10.00mm ST Series PCB Drill, are a universal drill bit witch can be used for many materials.